Bullfrog Productions Limited was a British video game developer based in Guildford, England. Founded in 1987 by Peter Molyneux and Les Edgar, the company gained recognition in 1989 for their third release, Populous, and is also well known for titles such as Theme Park, Magic Carpet, Syndicate, and Dungeon Keeper. Bullfrog's name was derived from an ornament in the offices of Edgar's and Molyneux's other enterprise, Taurus Impact Systems, Bullfrog's precursor where Molyneux and Edgar were developing business software. Bullfrog Productions was founded as a separate entity after Commodore mistook Taurus for a similarly named company. Electronic Arts, Bullfrog's publisher, acquired the studio in January 1995. 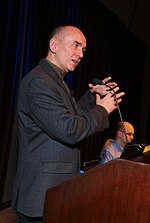 Molyneux had become an Electronic Arts vice-president and consultant in 1994, after EA purchased a significant share of Bullfrog. Molyneux's last project with Bullfrog was Dungeon Keeper, and as a result of his dissatisfaction of the corporate aspects of his position, he left the company in July 1997 to found Lionhead Studios. Others would follow them to Lionhead, and some founded their own companies, such as Mucky Foot Productions. After Molyneux's departure, Electronic Arts' control over Bullfrog caused several projects to be cancelled. Bullfrog was merged into EA UK in 2001 and ceased to exist as a separate entity. Bullfrog titles have been looked upon as a standard for comparison and have spawned numerous spiritual sequels. In 1982, entrepreneur Peter Molyneux met Les Edgar at a computer shop called PJ Hi-Fi. When Molyneux left the company where he was working, Edgar suggested that they start a new one, which would later develop business software for the Commodore 64 as Taurus Impact Systems (also known as Taurus Software). The new company was named after Molyneux and Edgar's shared astrological sign, the Taurus. At some point, Molyneux accepted a deal to export money systems to Switzerland and baked beans to the Middle East. One day, Taurus received a call from the head of Commodore Europe, wanting to discuss the future of the Amiga, and Taurus' software's suitability for the system. Molyneux was invited to Commodore Europe's headquarters, where he was offered several Amiga systems and a space at a show in Germany. When Molyneux was told that they were anticipating getting his network running on the Amiga, he realised that they had mistaken his company for one called Torus, a producer of networking systems. Molyneux wanted the Amiga systems, so he did not inform Commodore of their error. He received them and began writing a database program called Acquisition. Commodore kept asking about the database, and Molyneux gave them excuses because they were threatening to shut Taurus down. When Acquisition was finished, it was shown at the exhibition in Germany, and won product of the year. 2000 copies were sold to a company in the United States, giving Molyneux and Edgar funds to sustain Taurus. Another program Taurus wrote was a computer-aided design (CAD) package called X-CAD. They knew the Amiga was becoming a gaming machine, and a friend of Molyneux's asked him to convert Druid II: Enlightenment from the Commodore 64 to the Amiga. According to Edgar, it was around this time Bullfrog was founded in preparation for the day when Acquisition was no longer important and they could focus on games. Bullfrog was originally a brand of Taurus; Molyneux explained that this was because they wanted to avoid confusion over business software and money-making opportunities. The name came from an ornament of a bullfrog located in the office: when asked by Joystick why the name "Bullfrog" was chosen, Molyneux stated that they wanted "an idiotic name" without having to find one, and there happened to be a sculpture of a colourful frog on a pedestal labelled "Bull Frog by Leonardo" on the table. Afterwards, Molyneux and Edgar were running out of money, and Edgar suggested they close the company down. It was at this point when Molyneux came up with the idea of Populous. The conversion of Druid II: Enlightenment, Populous, and a shoot 'em up game called Fusion were the first games developed under the Bullfrog brand. Populous was difficult to publish at first due to lack of recognition—the god genre was, according to Bullfrog, "misunderstood by everyone". Despite this, Electronic Arts were willing to publish the game. Molyneux did not expect it to be successful, yet in 1989, the game received 10 awards, and another 12 the following year, with sales reaching one million copies. It ultimately sold four million copies. Edgar took note of the game's success, and gave developers such as Imagineer licences to create ports for platforms such as the Super Nintendo Entertainment System (SNES) and Sega Mega Drive, which enabled the game to gain traction in Japan. After Populous, Bullfrog moved into the Surrey Research Park, and had around 20 employees. Bullfrog were starting to gain a reputation, so people started to want to work for the company. Molyneux searched for staff himself, and employed artists and programmers. He travelled to universities, including Cambridge, where he offered computer scientists and banks the chance to come to the gaming industry. Bullfrog's Powermonger was released in 1990, and was developed as a result of pressure from Electronic Arts for a follow-up to Populous. Powermonger won multiple Best Strategy Game awards, including one from Computer Gaming World (as did Populous). The direct sequel to Populous, Populous II: Trials of the Olympian Gods, was released the following year, and ultimately sold over a million copies. In late 1993, Bullfrog worked with researchers from the University of Surrey, who were nearby their offices, to study the movement and behaviour of underwater life so Bullfrog could reproduce it in their software, namely in a game called Creation. By the mid-1990s, Bullfrog had become well known for innovation and quality. A 1995 article in GamePro stated that "Bullfrog's work has been termed some of the most innovative by industry leaders, and it's pioneered different genres of software." The same year, Next Generation similarly asserted that "Bullfrog has earned a reputation as one of the most consistently innovative and imaginative development teams in the world." In July 1995, Edge stated that Bullfrog had "an unparalleled reputation for quality and innovation", and by that year, Bullfrog were "rightly considered one of the most innovative in the world" according to GamesTM. In 1994, three games were in development: Creation, Theme Park, and Magic Carpet. Bullfrog focused on implementing multiplayer in all three games, and Molyneux believed that multiplayer was more important than the CD format. Theme Park and Magic Carpet were released that year, the latter being the best-selling CD game that Christmas, and winning Game of the Year awards in the United Kingdom and Germany. Theme Park proved extremely popular in Japan, and was a best-seller in Europe. During the development of Theme Park, artist Gary Carr left Bullfrog after a disagreement with Molyneux on the game; Molyneux wanted gaily coloured graphics that would appeal to a Japanese market, but Carr disapproved believing it would not work. He joined The Bitmap Brothers, but returned in 1995 to work on Dungeon Keeper, although he ended up working on Theme Hospital instead as the lead artist. In November 1994, Bullfrog began development for Dungeon Keeper. By then, the company had been approached many times to do film licences. McDonald's approached Bullfrog at some point for a joint game venture. By mid-1995, after "some years", Bullfrog was now focused in a major way on artificial intelligence, and had a dedicated artificial intelligence team working at its offices. Two techniques, Personality Mapping and Skeletal Mapping, had been developed. According to Edgar, Bullfrog began merger talks with Electronic Arts in 1993. To get the best deal, he believed Bullfrog should also talk with other companies such as Sony and Virgin. He explained that Electronic Arts was the obvious choice as Bullfrog already had a positive relationship with them. According to Molyneux, Bullfrog received numerous offers, expressing interest in purchasing the company. The offers were not taken seriously until major companies, such as Electronic Arts and Philips, made contact; it was then thought that the acquisition by one of these companies would be inevitable. Bullfrog was bought by Electronic Arts in early January 1995. At the time, interest in acquiring Bullfrog grew, as they had around 35 employees. By the time of Electronic Arts' acquisition, their workforce had expanded to around 60. As a result of the acquisition, this number increased to 150 within months of Electronic Arts' expansion of the studio. Molyneux became a vice-president of Electronic Arts and head of their European studio, and Edgar became vice-president of its European Studios and Bullfrog's chairman. He described Bullfrog becoming part of a multinational company as "a very big change", and worked for Electronic Arts to assist with the transition. Although Molyneux had said that Bullfrog's products would not suffer as a result of Electronic Arts' purchase, the number of games in development meant that there was less time to refine them (despite the company's growth rate), affecting their quality. After the release of Magic Carpet, seven games were in development: Magic Carpet 2, Theme Hospital, The Indestructibles, Syndicate Wars, Gene Wars, Creation, and Dungeon Keeper. After Electronic Arts' purchase, Molyneux was told to release a game, namely Magic Carpet 2 or Dungeon Keeper, within six weeks. Neither were near completion, so to appease Electronic Arts, Hi-Octane was developed. This predicament was the reason for the game's creation and rushed development, and as of July 1995, the project did not have a name. Molyneux explained that Bullfrog's games were normally original, and they were not concerned about them being copied, but the project was "a little derivative", which was why it was kept secret—even Edgar was not informed of the project at first. Around this time, Bullfrog had a reputation for having largely ignored 16-bit game consoles, and Syndicate Wars was the company's first title developed originally for a console—the PlayStation. As Molyneux had been made vice-president of Electronic Arts, his corporate role and responsibility increased considerably and he began making frequent trips to San Francisco. Over time, he grew increasingly frustrated with the position and wished to return to game developing. In July 1996, Molyneux decided to resign from Bullfrog to focus on game design, rather than become a mere employee. In response, Electronic Arts banned him from their offices, forcing him to move development of Dungeon Keeper to his house. Molyneux speculated that this was because they were scared that he would take people with him. He decided to leave as soon as Dungeon Keeper was finished, and commented: "My last day will be the day that this game goes into final test. I'm very, very, very sad, but also very relieved." He also said that Electronic Arts were "unbelievably patient", and thanked Vice-President Mark Lewis for campaigning for Dungeon Keeper's completion. Molyneux's planned departure was his motivation to make Dungeon Keeper good. He believed that he would enjoy being an executive, but said that it was "an utter nightmare". Shortly after his departure, Molyneux said he still had feelings for Bullfrog, and wished them success. Despite his dissatisfaction with the corporate aspects of being vice-president, Molyneux said that he had learned "an enormous amount". In 2017, he revealed that his resignation was the consequence of his, and technical director Tim Rance's, drunkenness. He said he would take his resignation email back if he could. Around this time, as Electronic Arts increased control over Bullfrog, others had similar feelings. Mark Healey (lead artist of Dungeon Keeper stated that the company "felt more like a chicken factory" after Electronic Arts' takeover, and also compared it to being assimilated by the Borg. Glenn Corpes (artist of Fusion and Populous) was not surprised at Molyneux's departure, and another employee believed that working for Bullfrog had become "a job", and that the company had lost its innovation. In 2008, Electronic Arts' president John Riccitiello corroborated these sentiments by admitting that their "dictatorial managerial approach" had suppressed Bullfrog's creativity. Sean Cooper (designer of Syndicate) said that if he could travel back in time, he would probably force Molyneux to refrain from selling Bullfrog to Electronic Arts, and described it as "such a horrible time". Molyneux believed that Electronic Arts had good intentions for Bullfrog and said that "they just wanted to make it nicer", and put their effects on the company down to "love abuse". When Dungeon Keeper was nearing completion in 1997, Molyneux, Rance, and Mark Webley (project leader of Theme Hospital) made the decision to found a new company, Lionhead Studios. The studio was founded in July, and by the time their first game, Black & White, was released, Bullfrog employees such as Healey, Andy Bass (an artist who worked on Theme Hospital), Russell Shaw (composer for various titles), James Leach (Bullfrog's script writer), Paul McLaughlin (who worked on Creation), and Jonty Barnes (a programmer who worked on Dungeon Keeper) had joined Lionhead. Healey stated that, because of his dissatisfaction, he was happy to follow Molyneux, and became Lionhead's first artist. Also in 1997, Mike Diskett (Project Leader, Lead Programmer, and Lead Designer of Syndicate Wars), Finn McGechie (lead Artist of Magic Carpet), and Guy Simmons left to found Mucky Foot Productions, with Carr joining them the following year. Other notable people at Bullfrog around the mid-1990s include Simon Carter (lead programmer of Dungeon Keeper), Richard Reed (project leader of Gene Wars), Mike Man (lead artist of Syndicate Wars)), Alan Wright (project leader and lead programmer of Magic Carpet 2), and Eoin Rogan (lead artist of Magic Carpet 2). In 1998, two games were released: Theme Aquarium, and Populous: The Beginning. Theme Aquarium was an attempt to "cross barriers" between the United Kingdom and Japan. Edgar explained that Bullfrog was more successful than most western game developers in Japan due to Populous and Theme Park, and wondered about the possibilities of having a game designed in the United Kingdom, and implemented in Japan by Japanese development teams. A small group was set up to do this. Theme Aquarium was released as a Theme game in Japan only; western releases removed the Bullfrog branding. As of 2012, many ex-Bullfrog employees were unfamiliar with the game. Shortly before Molyneux's departure, Bullfrog announced that the games then in development may be the final ones released for MS-DOS. It was "quite likely" that all future games would be Windows-only. The reason for the change in platform focus was so Bullfrog could create games with Windows in mind, and use "powerful features" (such as 3D acceleration) which were difficult to use with DOS. In 1999, Theme Park World and Dungeon Keeper 2 were released. Most of Theme Park World's development team were from Mindscape—they were brought to Bullfrog wholesale. Bullfrog worked with their sister company Maxis to release Theme Park World in North America under their Sim brand as Sim Theme Park to further establish themselves in the region. Theme Resort, a Theme game based around holiday islands, was in development, but cancelled, and its team joined the development team for Theme Park World. Dungeon Keeper 2 had a new development team led by Nick Goldsworthy, previously an assistant producer for Theme Park at Electronic Arts. During development, Colin Robinson was interviewed for the role of Bullfrog's chief technical officer, and helped the project succeed. In 2016, Glenn Corpes speculated that Electronic Arts did not understand Molyneux's role at Bullfrog and thought he was in charge of everything and that their response to his departure would be to install managers. In fact, he focused on one game at a time, and let others carry out their work. In mid-1999, Edgar stepped down as chairman. He was succeeded as managing director by Bruce McMillan of Electronic Arts' Canadian studios. Corpes also left to found a company called Lost Toys with Jeremy Longley (who had worked on Theme Hospital, Syndicate Wars, and Populous III) and Darren Thomas (who had worked on Dungeon Keeper, Magic Carpet 2, and was the lead artist on Theme Park World), which was supported financially by Edgar. Corpes stated that he was inspired by Mucky Foot Productions running their own affairs, and that it was "quite embarrassing to still be working for the Borg". He also said that Lost Toys was partially his take on what Bullfrog was. Alex Trowers (a designer who had worked on Syndicate and Powermoner) left for Lost Toys and also believed that Bullfrog had become too corporate after Electronic Arts' takeover, and that Lost Toys would return to "making games for the sake of making games" rather than to satisfy shareholders. In August 1999, Electronic Arts appointed Ernest Adams as the lead designer of the fourth instalment in the Populous series, Genesis: The Hand of God. Bullfrog's management had concerns about its similarity to Lionhead Studios' Black & White, and the project was cancelled. Adams then became the lead designer on Dungeon Keeper 3. As Dungeon Keeper 2 did not perform as well as hoped, the team were instructed to make the third game more accessible. Development began in November, but Electronic Arts' focus was changing. They were in negotiation with J.K. Rowling and New Line Cinema for the rights to Harry Potter and The Lord of The Rings, respectively. Electronic Arts saw a profitable opportunity, and in March 2000, Dungeon Keeper 3 was cancelled in favour of those franchises, although its cancellation was not officially announced until August. Bullfrog moved to Chertsey in 2000, and went through "a quiet patch" for the remainder of the year. The final title released under the Bullfrog brand, Theme Park Inc, was published in 2001. By the time the game was in development, most of the Bullfrog teams had become part of EA UK, and much of the development was handled by another company. What remained of Bullfrog Productions was then incorporated and merged into EA UK, effectively closing the studio. Peter Molyneux stayed with Lionhead Studios until the formation of 22Cans. Les Edgar had some involvement with the gaming industry since Bullfrog, but left for the automotive industry. In August 2009, Electronics Arts were considering revising some of Bullfrog's games for modern-day systems. Lionhead Studios – Founded by Peter Molyneux, Mark Webley, and Tim Rance (as well as Steve Jackson, co-founder of Games Workshop and co-author of the Fighting Fantasy books), Lionhead are best known for their Black & White and Fable series. The company closed down on 29 April 2016. Mucky Foot Productions – Founded by Mike Diskett, Fin McGechie, and Guy Simmons. Gary Carr joined shortly afterwards. A deal with Eidos Interactive was signed, and Mucky Foot Productions developed three games: Urban Chaos, Startopia, and Blade II The company closed in 2003. Media Molecule – Best known for LittleBigPlanet, Media Molecule was established by Mark Healey, as well as Alex Evans, Dave Smith, and Kareem Ettouney. Intrepid Computer Entertainment – This company was started by Joe Rider and Matt Chilton, and signed by Microsoft as a first-party developer. Intrepid closed in 2004, and its employees moved to Lionhead Studios. Big Blue Box Studios – Founded by Bullfrog programmers Simon and Dene Carter, and Ian Lovett (who worked on Magic Carpet and Dungeon Keeper), Big Blue Box Studios were "very close" to Lionhead Studios, and the two companies merged. 22Cans – Founded in 2012 by Molyneux after he left Lionhead. 22Cans are known for Godus, which took inspiration from Populous and Dungeon Keeper, as well as Lionhead's Black & White. Two Point Studios – Founded in 2016 by Gary Carr and Mark Webley, Two Point Studios signed a publishing deal with Sega in May 2017. Several Bullfrog games have spawned spiritual successors, or have been used as a base for comparison. Dungeon Keeper has influenced several games, including War for the Overworld, and Mucky Foot's Startopia, the former being described as "a true spiritual successor to Dungeon Keeper". DR Studios' Hospital Tycoon has been compared to Theme Hospital. Satellite Reign (programmed by Mike Diskett) has been labelled a spiritual successor to the Syndicate series. Two Point Hospital, developed by Two Point Studios, was announced on 16 January 2018 and is considered to be a spiritual successor to Theme Hospital. In October 2013, Jeff Skalski of Mythic Entertainment, which produced a free-to-play remake of Dungeon Keeper for mobile platforms, said he would like to remake other Bullfrog titles, and described the company as "unstoppable". Theme Park also received a freemium remake in December 2011. Ember – Players would have been piloting a speeder craft to repair a microprocessor chip, competing against a rival trying to undo the player's repairs. Colony – An arcade adventure puzzle game in which players would have been attempting to save the passengers and crew of a cryogenic ship by repairing the cryogenic suspension system, using video cameras to monitor activity on the ship. Hell – A scrolling shoot 'em up based in the underworld, and based on Joust. The Indestructibles – Described as "an action-beat-'em-up-strategy-everything game", The Indestructibles would have involved creating superhumans to defend cities from invaders. Creation – Set in the same reality as Syndicate, Creation would have had the player battling to transform an alien water world. Void Star – This was to be a 3D real-time strategy game set in space, but was cancelled it was believed that there would be no interest in the concept. Theme Resort, Theme Prison, Theme Ski Resort, and Theme Airport – These were "talked about" after the release of Theme Hospital, but never materialised due to Mark Webley and Gary Carr leaving for other companies. Theme Resort was in development (according to Webley, its team were trying to have a trip to Club Med for research), and its team joined Theme Park World after cancellation. Webley stated that Bullfrog intended to explore other possibilities for its Designer Series (of which Theme Park and Theme Hospital are part of), but Electronic Arts had it shut down. Genesis: The Hand of God – Intended to be the next instalment in the Populous series, but was cancelled due to similarities to Lionhead's Black & White. Dungeon Keeper 3 – Project was cancelled in favour of film franchises such as Harry Potter and Lord of The Rings. Bullfrog also decided to cease developing real-time strategy games. Theme Movie Studio – Did not make it past the concept stage. ^ Steve Jackson (1998). "Diary 4". Lionhead Studios. Guildford. Archived from the original on 16 June 2001. Retrieved 15 July 2018. ^ "Viruksen kourissa". Pelit (in Finnish). 21 March 2006. ^ a b c d e f g h i j k l m n o p q r s t u v w x y "In The Chair With Peter Molyneux". Retro Gamer. No. 71. Bournemouth: Imagine Publishing. pp. 82–89. ISSN 1742-3155. ^ a b c d e f g h i j k l m n o p q Dulin, Ron. "GameSpot Presents Legends of Game Design: Peter Molyneux". GameSpot. Archived from the original on 30 August 2005. Retrieved 26 April 2012. ^ a b c d e f g h i "Work In Progress Bullfrog". The One. No. 12. EMAP. September 1989. pp. 24–28. ISSN 0955-4084. Retrieved 12 June 2017. ^ a b c d e f g h i j k l m n o "Bullfrog Productions: A History Of The Legendary UK Developer". NowGamer. 22 February 2012. Retrieved 11 June 2017. ^ a b "Bullfrog Entretien Avec Peter Molyneux : Créateur, Programmeur Et Co-fondateur De Bullfrog" [Interview With Peter Molyneux : Creator, Programmer And Co-founder Of Bullfrog]. Joystick (in French). No. 42. October 1993. pp. 85, 86. ^ a b c d e f "Bullfrog Gameology". Bullfrog Bulletin. No. 4. Guildford: Bullfrog Productions. 1997. p. 3. ^ a b c d "Kings of the God Game". Retro Gamer. No. 43. Bournemouth: Imagine Publishing. pp. 52–57. ISSN 1742-3155. ^ "The Making Of: Populous". NowGamer. 27 January 2009. Archived from the original on 25 September 2017. Retrieved 25 September 2017. ^ a b c d e f g h i j k l m n o p q r s t u v w x y z aa ab ac ad ae af ag ah ai aj ak al am an ao ap aq ar "Revisiting Bullfrog: 25 Years On". Retro Gamer. No. 110. Bournemouth: Imagine Publishing. December 2012. pp. 60–67. ISSN 1742-3155. ^ a b c "Funtime at Bullfrog". Prescreen. Edge. No. 4. Bath: Future plc. January 1994. pp. 37–43. ISSN 1350-1593. ^ a b c d e f g h i "Bullfrog". Edge. No. 22. Bath: Future plc. July 1995. pp. 25–27. ISSN 1350-1593. ^ "EA Kisses a Frog". GamePro. No. 69. IDG. April 1995. p. 147. ISSN 1042-8658. Retrieved 12 June 2017. ^ "75 Power Players". Next Generation. No. 11. Imagine Media. November 1995. p. 51. ISSN 1078-9693. Archived from the original on 18 March 2017. Retrieved 12 June 2017. ^ "Developer Profile Lionhead Studios". GamesTM. No. 80. p. 166. ISSN 1478-5889. ^ "Theme Park". Saturn Preview. Mean Machines Sega. No. 36. Peterborough: Emap International Limited. October 1995. pp. 42, 43. ISSN 0967-9014. Retrieved 11 June 2017. ^ Julian Benson (29 June 2017). "How the makers of Theme Hospital made hospital wards and diseases funny". PCGamesN. Archived from the original on 31 July 2017. Retrieved 31 July 2017. ^ a b c "The Making of Theme Hospital". Retro Gamer. No. 130. Bournemouth: Imagine Publishing. June 2014. pp. 46–51. ISSN 1742-3155. ^ Melissa Tyler; Shin Kanaoya (1997). "Keeper Chronology". Bullfrog's Official Guide to Dungeon Keeper. Prima Publishing. p. 264. ISBN 978-0-7615-0714-7. ^ a b "An Audience With Peter Molyneux". Interview. Edge. No. 14. Bath: Future plc. November 1994. pp. 98–101. ISSN 1350-1593. ^ Business Wire (6 January 1995). "Electronic Arts to acquire leading European software developer, Bullfrog Productions Ltd". AllBusiness. Archived from the original on 5 December 2008. Retrieved 13 April 2008. ^ a b Jason Schreler (11 March 2014). "The Man Who Promised Too Much". Kotaku. Archived from the original on 15 January 2016. Retrieved 11 June 2017. ^ "PRESS RELEASE Mr. LES EDGAR". Lincoln Beasley. Archived from the original on 23 December 2005. Retrieved 12 June 2017. ^ a b c d e "An Audience With Les Edgar". Audience. Edge. No. 74. Bath: Future plc. August 1999. pp. 120–125. ISSN 1350-1593. ^ Ramshaw, Mark James (May 1996). "Generator". Next Generation. No. 17. Imagine Media. p. 28. ISSN 1078-9693. ^ a b c d e "Welcome to the House of Molyneux". PC Gamer UK. No. 44. Future Publishing. June 1997. pp. 74, 75. ISSN 1470-1693. ^ a b "An Audience With Peter Molyneux". audience. Edge. No. 47. Bath: Future plc. July 1997. pp. 22–27. ISSN 1350-1593. ^ a b c d e f g h "The Making Of: Dungeon Keeper". Retro Gamer. No. 143. Bournemouth: Imagine Publishing. pp. 64–69. ISSN 1742-3155. ^ a b c Melissa Tyler; Shin Kanaoya (1997). "Brief Words from the Dark Creator-Overlords". Bullfrog's Official Guide to Dungeon Keeper. Prima Publishing. pp. 252–263. ISBN 978-0-7615-0714-7. ^ a b Alex Osborn (4 April 2017). "Peter Molyneux Departed Bullfrog Over a Drunken Email". IGN. Retrieved 14 June 2017. ^ Chris Higgins (9 April 2016). "Bullfrog 'stopped being the same' after EA takeover". PCGamesN. Archived from the original on 23 September 2016. Retrieved 14 June 2017. ^ a b "In The Chair WIth Mark Healey". Retro Gamer. No. 139. Bournemouth: Imagine Publishing. pp. 92–97. ISSN 1742-3155. ^ a b c d "In The Chair With Glenn Corpes". Retro Gamer. No. 160. Bournemouth: Imagine Publishing. October 2016. pp. 92–97. ISSN 1742-3155. ^ "EA chief: We killed Bullfrog". BCS. 13 February 2008. Retrieved 14 June 2017. ^ a b Jason Schreier (20 March 2014). "One Explanation Behind EA 'Destroying' Bullfrog". Kotaku. Archived from the original on 1 October 2017. Retrieved 1 October 2017. ^ "Hospital Update". Bullfrog Bulletin. No. 3. Guildford: Bullfrog Productions. 1996. p. 11. ^ a b James Leach; Christian Bravery (2001). "Introduction". The Making Of Black & White. Roseville, Calif.: Prima Games. pp. 4, 5. ISBN 978-0-7615-3625-3. ^ a b c d e "Behind The Scenes Theme Hospital". GamesTM. No. 113. September 2011. pp. 128–131. ISSN 1478-5889. ^ "Water, Water Everywhere...". Bullfrog Bulletin. No. 3. Guildford: Bullfrog Productions. 1996. pp. 15–17. ^ James Leach; Christian Bravery (2001). "the lionhead team". The Making Of Black & White. Roseville, Calif.: Prima Games. pp. 94, 95. ISBN 978-0-7615-3625-3. ^ "Bullfrog". Prescreen. Edge. No. 31. Bath: Future plc. April 1996. pp. 42–45. ISSN 1350-1593. ^ "A Moment With Mike Diskett". Retro Gamer. No. 136. Bournemouth: Imagine Publishing. p. 16. ISSN 1742-3155. ^ a b "How to finish a game". Bullfrog Bulletin. No. 4. Guildford: Bullfrog Productions. 1997. pp. 10, 11. ^ "Now that's MAGIC!". PC Gamer. Vol. 1 no. 9. Bath: Future plc. August 1994. pp. 42–50. ISSN 1470-1693. ^ Kieran Gillen (22 April 2008). "The Rise and Fall of the Mucky Foot". The Escapist. Archived from the original on 31 July 2017. Retrieved 30 July 2017. ^ "Syndicate Wars". Bullfrog Bulletin. No. 3. Guildford: Bullfrog Productions. 1996. pp. 4–7. ^ a b Bullfrog (1995). "Credits". Magic Carpet 2 Playguide (PC ed.). Slough: Electronic Arts. p. 27. ^ a b "What's With Windows 95?". Bullfrog Bulletin. No. 4. Guildford: Bullfrog Productions. 1997. p. 12. ^ James Fudge (7 August 1999). "Theme Park World Gets North American Name Change". Computer Games Magazine. Archived from the original on 9 July 2003. Retrieved 13 September 2017. ^ Bullfrog (1994). "Credits". Theme Park Manual (PC ed.). Slough: Electronic Arts. p. 77. ^ "Inside silicon valley, UK". Edge. No. 76. Bath: Future plc. October 1999. pp. 74–81. ISSN 1350-1593. ^ "An Audience With Lost Toys". Audience. Edge. No. 71. Bath: Future plc. May 1999. pp. 107–111. ISSN 1350-1593. ^ a b "Inside... Lost Toys". Edge. No. 107. Bath: Future plc. February 2002. pp. 38–42. ISSN 1350-1593. ^ "The World According To Lost Toys". PC Zone. No. 88. London: Dennis Publishing. April 2000. pp. 158–161. ISSN 0967-8220. ^ a b c d e f g h Ernest Adams. "The Story Behind Dungeon Keeper 3". www.designersnotebook.com. Archived from the original on 3 March 2016. Retrieved 12 June 2017. ^ Sam Parker (1 August 2000). "Dungeon Keeper 3 Cancelled". GameSpot. Archived from the original on 27 September 2015. Retrieved 15 June 2017. ^ "The World According To Bullfrog". PC Zone. No. 89. London: Dennis Publishing. May 2000. pp. 158–161. ISSN 0967-8220. ^ Porter, Will. "PC Feature: 30 in 30: Bullfrog Productions – ComputerAndVideoGames.com". Computer and Video Games. Future Publishing. Archived from the original on 8 January 2014. Retrieved 15 June 2017. ^ Joe Martin (11 August 2009). "EA looking to revive classic Bullfrog games". Dennis Publishing Limited. Archived from the original on 25 March 2010. Retrieved 26 March 2010. ^ Allegra Frank (29 April 2016). "Lionhead Studios shuts its doors today". Polygon. Retrieved 16 December 2017. ^ Thorsen, Tor (3 November 2003). "Mucky Foot shutters doors – GameSpot.com". GameSpot. Archived from the original on 8 July 2012. Retrieved 27 April 2012. ^ Megan Farokhmanesh (31 August 2013). "Populous to Godus: The rubbish-filled road of Peter Molyneux". Polygon. Archived from the original on 19 March 2016. Retrieved 15 June 2017. ^ Stephanie Chan (30 May 2017). "Sega Europe's partnership with Two Point Studios is another sign of its PC growth". VentureBeat. Archived from the original on 27 August 2017. Retrieved 17 July 2017. ^ "SEGA ® Europe Ltd. announce publishing partnership with Two Point Studios". Gamasutra. 30 May 2017. Archived from the original on 21 October 2017. Retrieved 17 July 2017. ^ a b "Update #11: Kickstarter Demo Release, New Video". War for the Overworld. Archived from the original on 25 February 2017. Retrieved 16 June 2017. ^ Brett Todd (2 July 2007). "Hospital Tycoon Review". GameSpot. Archived from the original on 27 October 2014. Retrieved 15 June 2017. ^ Robert Purchese (13 July 2015). "Syndicate Wars-inspired Satellite Reign gets release date". Eurogamer. Archived from the original on 15 September 2015. Retrieved 15 June 2017. ^ Alasdair Duncan (1 July 2013). "Satellite Reign looks like the true Syndicate sequel". Destructoid. Archived from the original on 15 April 2016. Retrieved 15 June 2017. ^ "Theme Hospital creators announce Two Point Hospital". Metro. 16 January 2018. Retrieved 17 January 2018. ^ Michael McWhertor (16 January 2018). "Theme Hospital creators working on spiritual successor with Sega". Polygon. Retrieved 17 January 2018. ^ Joe Donnelly (16 January 2018). "Two Point Hospital is a new management sim from the creators of Theme Hospital". PC Gamer. Retrieved 17 January 2018. ^ Mark Brown (18 October 2013). "Dungeon Keeper dev on Theme Hospital for iPad: 'I would love to make more Bullfrog games'". Pocket Gamer. Archived from the original on 31 July 2017. Retrieved 31 July 2017. ^ Will Wilson (9 December 2011). "EA's free-to-play take on '90s Amiga classic Theme Park out now on iPhone and iPad". Pocket Gamer. Archived from the original on 31 July 2017. Retrieved 31 July 2017. ^ "Behind the scenes of Magic Carpet". GamesTM. Archived from the original on 1 April 2016. Retrieved 12 June 2017. ^ "Bullfrogger Exclusive Complete Game From Bullfrog!". Amiga Power. No. 6. Future plc. October 1991. p. 8. ISSN 0961-7310. Archived from the original on 21 February 2017. Retrieved 12 June 2017. ^ a b Christian Donlan (9 February 2014). "The lost worlds of Lionhead and Bullfrog". Eurogamer. Archived from the original on 14 March 2014. Retrieved 3 March 2014. ^ Alex Trowers. "Gameraki: The ones that got away". Archived from the original on 29 July 2014. Retrieved 19 July 2014. ^ "Bullfrog makes designs". PC Gamer. Vol. 1 no. 7. Bath: Future plc. June 1994. p. 24. ISSN 1470-1693. ^ a b Ernest Adams. "Game credits". www.designersnotebook.com. Archived from the original on 11 July 2014. Retrieved 18 July 2014.